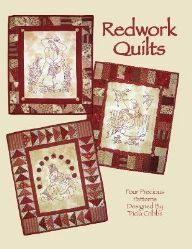 If you love Redwork and like to do small quilts, you will adore this beautiful book. 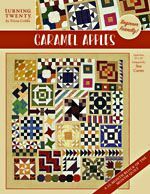 There are patterns for 4 small quilts in this full color book. Pages of beautiful color photos and diagrams will surely make you want to pull out your stitchery supplies and begin one of these lovely stitchery designs. 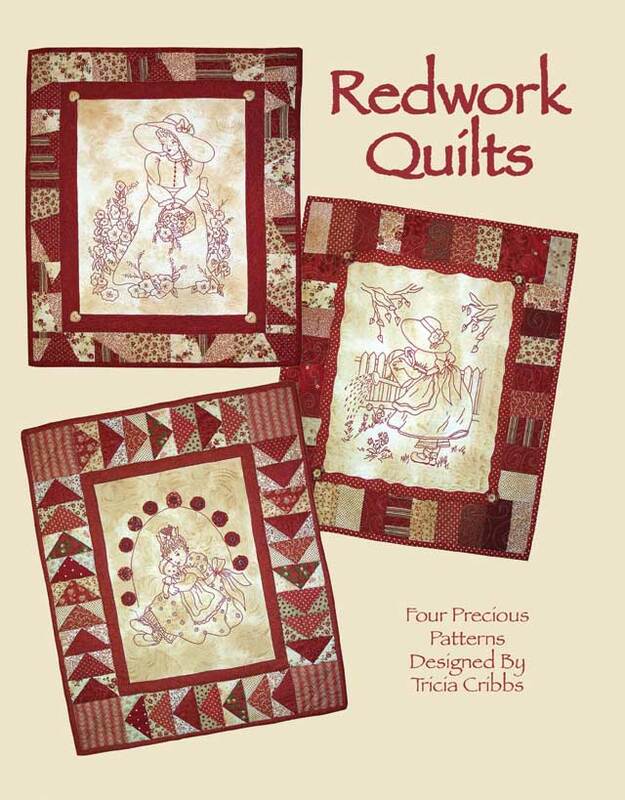 All four patterns included in book. 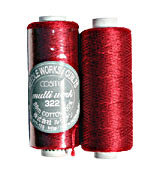 I have always admired Redwork, but actually wanted a more vintage look. My drawings tend toward children, home, family, and creation. I begin my stitching on a solid white background and then use my own method for dying the finished quilt to get the vintage look that I like. 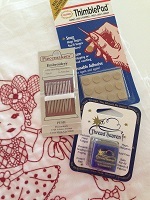 If you like the look, the method is included in the book. 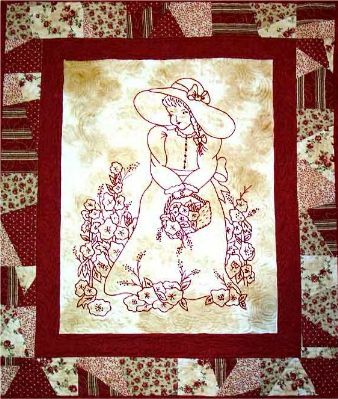 Size - 21" x 25"
What precious memories this stitchery will bring to those of us who have all of our lives loved to walk among the flowers. As I was drawing this little girl, I was taken back to a time when things were simpler. This makes me think of my little sister. She was pretty much a tom boy when we were children, but inside her somewhere was a very feminine woman being formed. Karen is grandmother now and I asked her to name this one. 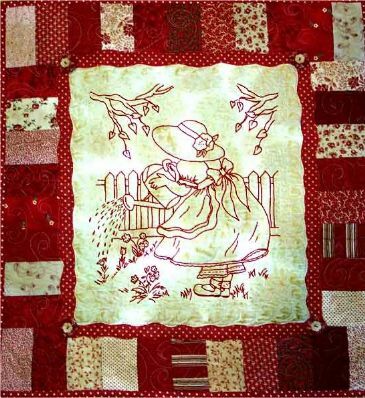 “Flowers of Blessing” seems very fitting, don’t you agree? 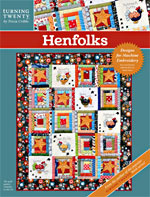 This pattern and 3 others are included in this full color book. 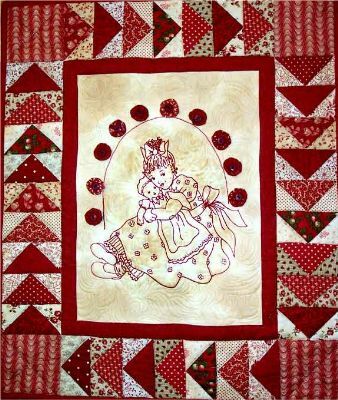 Hugging her dolly and sitting under an arch of red yo-yo’s, Baby Girl is easy to stitch. 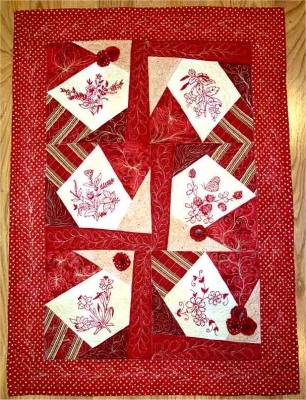 Instructions for making the flying geese border using the quick piecing method will make you proud of your finished quilt. 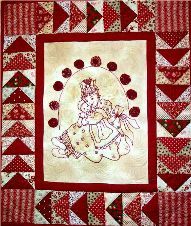 Gary named this little quilt after our daughter. Michelle will celebrate her 36th birthday this year, but she will always be her daddy’s Baby Girl. 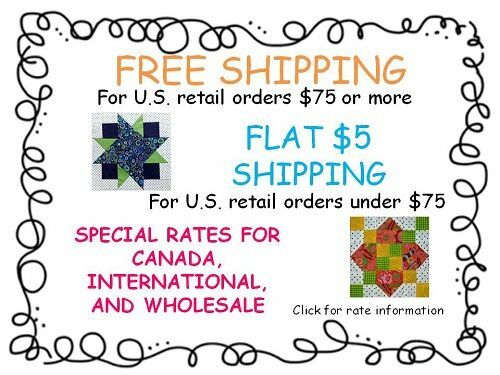 This pattern and 3 others are included in this full color book. 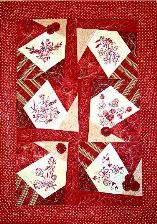 A stunning little Redwork quilt that requires one block to be pieced six times. 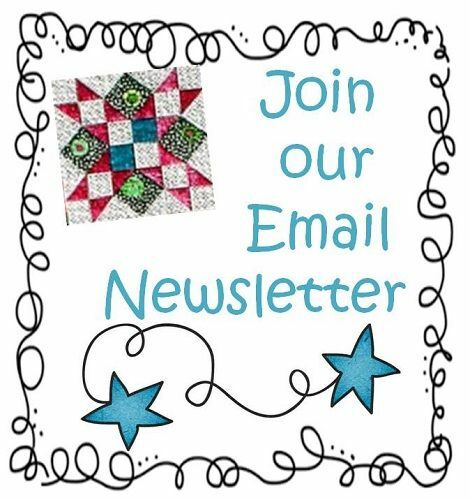 Rotate the block and stitch the flowers for a wonderful crazy quilt. Red has always been my favorite color, so I had to call this one Crazy for Red. This pattern and 3 others are included in this full color book. Size - 22" x 23"
“Thank you for the world so sweet, thank you for the food we eat, thank you for the birds that sing…………..Thank You God for Everything”. I can almost hear this little one saying her prayer as she tends to her flowers. Life is amazing when we take the time to notice all of the beauty that surrounds us! 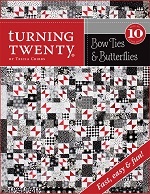 This pattern and 3 others are included in this full color book.